As the most valuable company on the planet, Apple has a pretty big spotlight shining on it. That's why Tim Cook is once again defending his company against accusations of avoiding taxes, relying too heavily on Chinese labor and providing criminals with a means to hide from law enforcement. In an exhaustive interview with Charlie Rose on CBS' "60 Minutes" Sunday, the Apple CEO talked about all the hot topics surrounding Apple in 2015. On encryption: "I don't believe that the tradeoff here is privacy versus national security." Cook told Rose that Apple is working with law enforcement to fight terrorism, but his stance on encryption remains unchanged. "If the government lays a proper warrant on us today then we will give the specific information that is requested. Because we have to by law," said Cook. "In the case of encrypted communication, we don't have it to give. And so if like your iMessages are encrypted, we don't have access to those." "There have been people that suggest that we should have a back door," he added. "But the reality is if you put a back door in, that back door's for everybody, for good guys and bad guys." Cook also stated that making the encryption debate about a tug of war between privacy and national security is an "overly simplistic view." "We're America," he said. "We should have both." On accusations of avoiding overseas taxes: "That is total political crap. There is no truth behind it." Apple (AAPL) made an $11.1 billion profit last quarter -- and two-thirds of its business is overseas. But lawmakers have accused Apple of using tax code loopholes to reduce its U.S. tax bill. 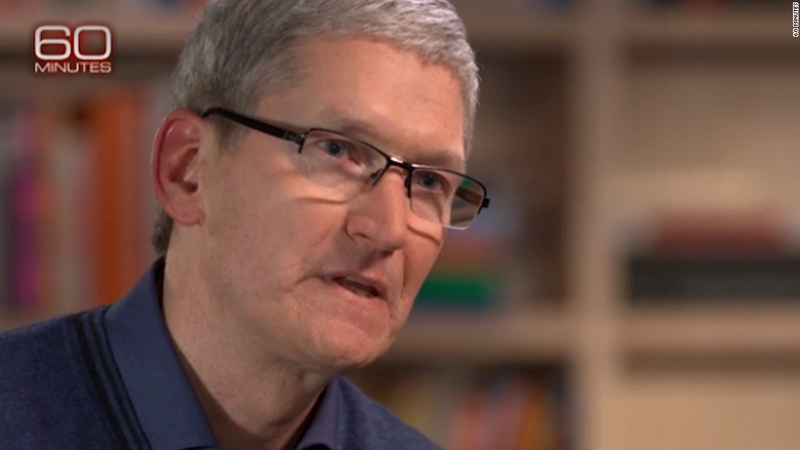 Cook fired back on Sunday, saying that the reason Apple doesn't bring that money back to the United States is because it "would cost me 40% to bring it home." "And I don't think that's a reasonable thing to do," said Cook. "This is a tax code, Charlie, that was made for the industrial age, not the digital age. It's backwards. It's awful for America. It should have been fixed many years ago. It's past time to get it done." On using Chinese labor: "Vocational kind of skills...[is] a focus of their educational system"
Apple's business relies heavily on China. The company has one million people manufacturing its products, and many have attacked Apple for not bringing those jobs back to the United States. Cook says it's not about wages, but about skill. "China put an enormous focus on manufacturing," Cook said. "The U.S., over time, began to stop having as many vocational kind of skills. I mean, you can take every tool and die maker in the United States and probably put them in a room that we're currently sitting in. In China, you would have to have multiple football fields." On Steve Jobs: "This is still Steve's company. It was born that way, it's still that way." Apple has been accused of lacking the ingenuity and drive for excellence that it exhibited when Steve Jobs was still CEO. But Cook said that Apple still embodies Jobs' ethos. "I've never met anyone on the face of the earth [like him]," Cook said about his predecessor. "[He] had this incredible and uncanny ability to see around the corner. Who had this relentless driving force for perfection."